The University of Maryland’s graduate and undergraduate teams received top honors in the Vertical Flight Society’s annual Student Design Competition, which challenges students to design a vertical lift aircraft that meets specified requirements. In the graduate category, UMD and Nanjing University of Aeronautics and Astronautics took top honors for designing an autonomous coaxial-proprotor swing-wing tailsitter that used visual sensory information and adjustable wing geometry to maneuver in megacity environments. 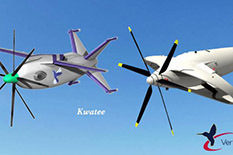 Lightweight turboshaft engines and an aerodynamic design were also included. The team named their design the “Metaltail” for the Tyrian Metaltail hummingbirds, which have the agility to hover precisely in place in complex and dynamic environments. They also developed a FLIGHTLAB model of their vehicle, winning the optional bonus portion of the competition. In the undergraduate category, UMD’s team won first place for designing a coaxial proprotor tail-sitter configuration utilizing a novel variable incidence box wing and bidirectional ducted fans. They called this the “Kwatee,” which boasted two flight modes with the capability for navigating in megacity environments and forward flight with a 426 km/h (230 knot) maximum dash speed and extended range of 354 km (440 miles), with a prolonged endurance of 4.1 hours. UMD has a strong record of excellence at this competition. Last year, UMD also placed first in both the graduate and undergraduate categories, and, in 2016 and 2015, UMD won the top award in the graduate category. This year, the US Army Research Laboratory (ARL) sponsored the competition with a total of $13,000 in prize money. The teams will be awarded a cash stipend and will be invited to the Vertical Flight Society's Annual Forum and Technology Display in May 2019 to present the details of their designs. Team members receive complimentary registration to the Forum, a technical event that promotes vertical flight technology advancement.